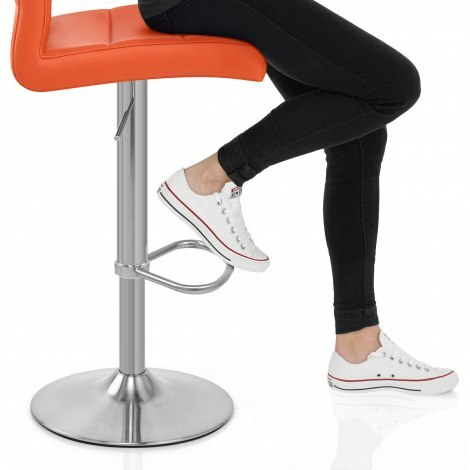 Guaranteed to make a statement, the Brushed Steel Breakfast Bar Stool Orange is a funky model with a bold look. Brightening up any space it graces, the Brushed Steel Breakfast Bar Stool is the perfect item to add a lively burst of colour to your interior. Vivid orange faux leather covers the seat, finished with horizontally stitched lines for a stylish aesthetic. 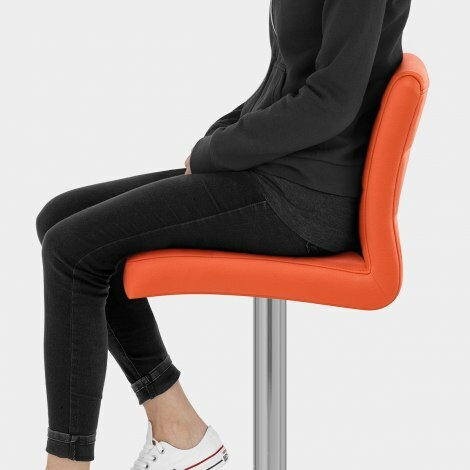 Ergonomically formed, the tall backrest is designed for optimum support, and both the seat and backrest are cushioned for superior levels of comfort. The sturdy steel frame boasts a hand-worked brushed finish, softening the look of this vibrant design. Plus, for maximum versatility, a gas-lift mechanism is incorporated into the frame. The Breakfast Bar Stool has a triangular footrest, and rests on a round base with an incorporated rubber floor guard to help to avoid unnecessary damage to your floors. "Really sturdy and well made"
Easy to put together and very sturdy, look amazing in my kitchen. Fast delivery, easy to assemble, look stunning. After having a new kitchen installed in dark and light grey colours i needed something to brighten up that room hense the choice of orange. I've only opened and put together one of the stools and i must say after trying it out for size I'm highly delighted with everything about it. Really sturdy and well made. I will not hesitate to recommend this product to family and friends. Very happy indeed. Arrived when I wanted - well packaged. The colour is fantastic and have really finished off my new kitchen breakfast bar. Very comfortable - easily spend the whole night on them.